The bond between man and dog is a story that has been told a thousand times and which is as old as history itself. These lovable canines have given humans selfless service and have carved an unparalleled role as man’s best friend. 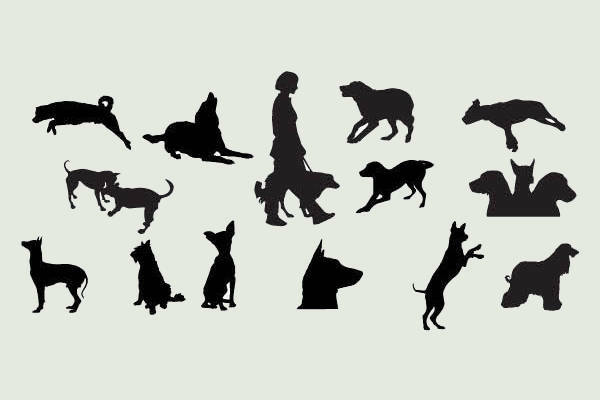 This set of 11 cute dog silhouettes is our compiled celebration of that unconditional friendship. If you want to integrate that sacred covenant between man and animal in your own way courtesy of a visual piece, then you can scroll down the images below and take your pick! We know that it is as easy as that. You can also see our Free Silhouette Designs listing. 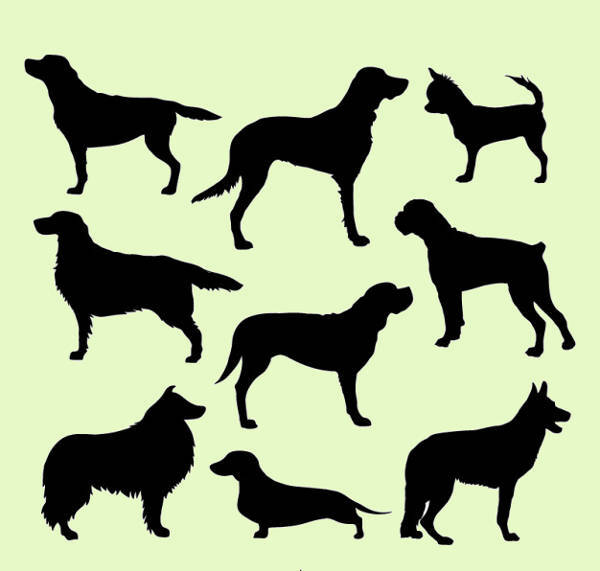 The White Vector Dog Silhouettes are elegantly washed in white. This silhouette is a great alternative to the usual dark against a light setting, especially as the six fluffy images have a bluish hue in its background. 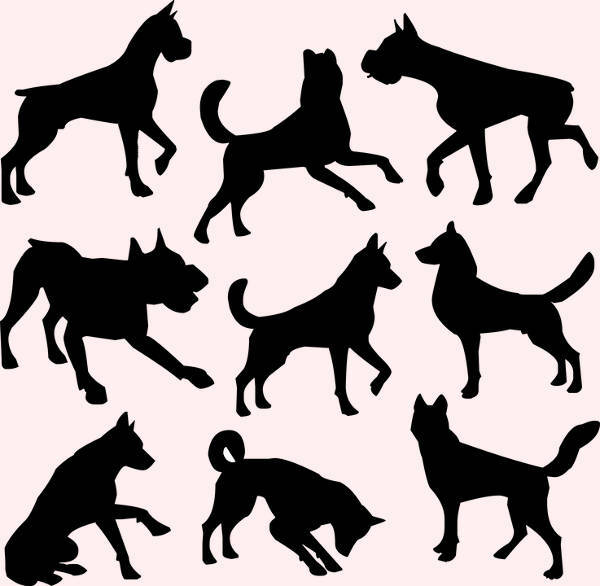 The Fully Customized Dog Silhouettes you can see above can be altered to your specifications. 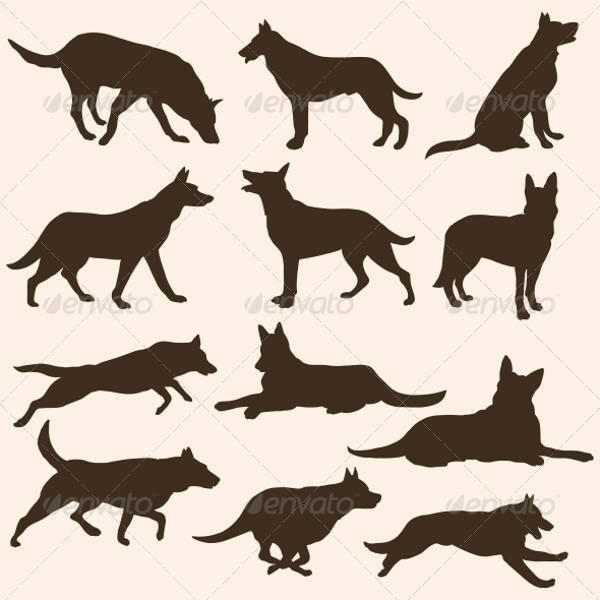 With this, we present to you a shadow drawing of the dog being walked by its owner as well as a triumvirate of the large breed of dogs. These lovable canines can be many things: fetch-obsessed, water-loving, house-destroying and unbelievably food-crazed. 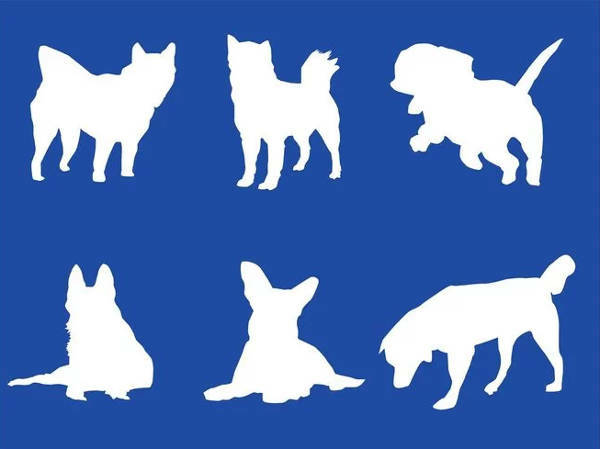 How about you check out these Playing Dog Silhouettes we have for you? 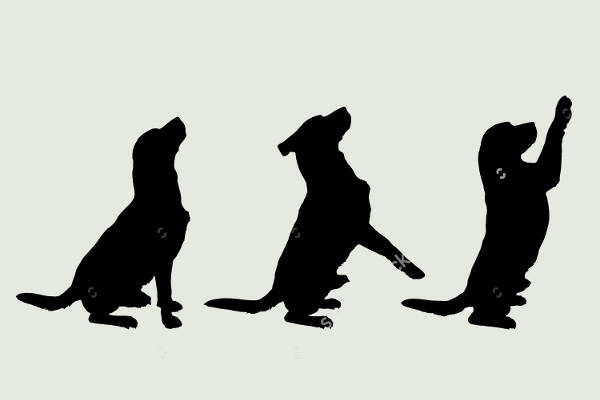 The three images feature the sequence of a dog begging its master to play. 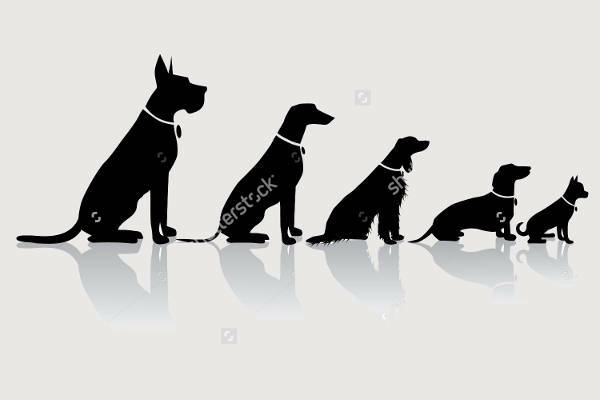 These black over white Sitting Dog Silhouettes can be used as a size chart for dog breeders and pet shop owners. 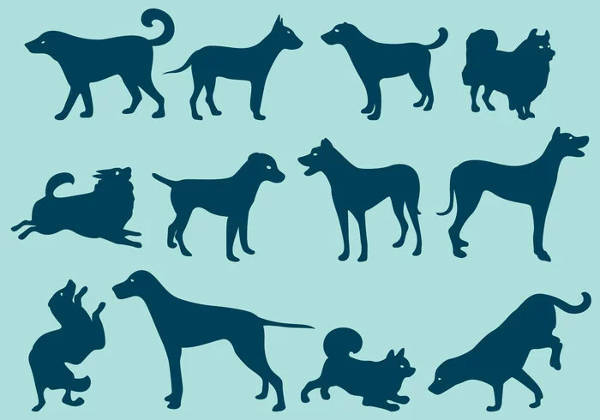 As a fact, the largest dog breed is the Great Dane which is a German breed of dog while the smallest is the chihuahua which has its origins in Mexico. 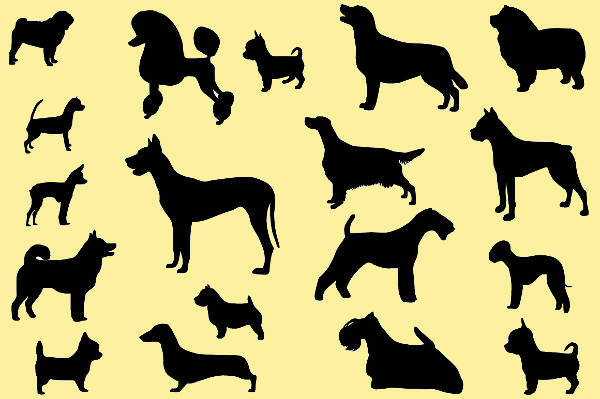 The outline drawing and shadow painting of this set of Colorful Dog Silhouettes are adjustable especially in PhotoShop. Use this a visual piece for a presentation or as a desktop wallpaper. 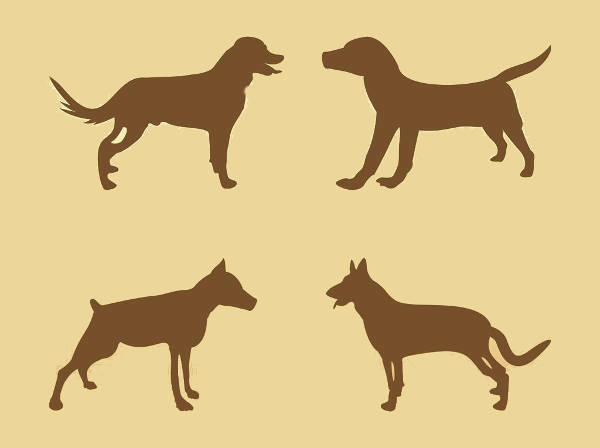 You can never go wrong with the various breeds shown here which are all in a playful mood. It’s a who’s who of dog breeds from a long silky haired Afghan Hound to the adroit Doberman Pinscher. You can also see our Deer Silhouettes and Horse Silhouette listings. These silhouette compilations are also available in both electronic and printable form. people who have an affinity to dogs. Show your love by displaying these images inside your home. Use them as a wallpaper in the kitchen or inside your the bathroom. 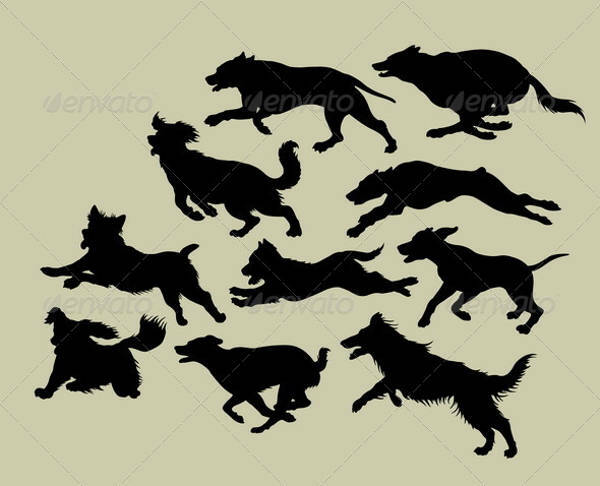 You can also see our Animal Silhouette listing.